The 2016 PHL Cup Champions continued their ascent in the 2016 PBA Commissioner’s Cup, dealing the erstwhile unbeaten Meralco Bolts their first taste of defeat in Legazpi City tonight. 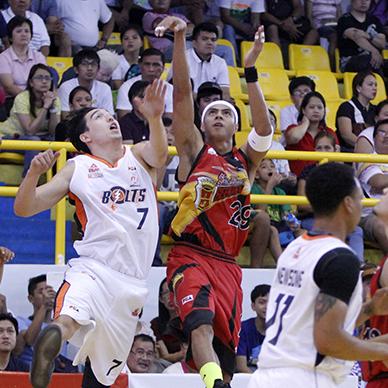 The San Miguel Beermen put an end to the unbeaten run of the Meralco Bolts, pulling out a 94-86 victory in their OPPO PBA Commissioner’s Cup clash Saturday in Legazpi, Albay. Import Tyler Wilkerson, who despite battling foul trouble all game long, still managed to deliver 27 points and 10 boards to pace the Beermen (3-1), who won their third straight game. Gabby Espinas also contributed 13 points, while Alex Cabagnot and Marcio Lassiter each had 10. Reigning back-to-back MVP June Mar Fajardo was only limited to six points on two-of-12 shooting, but he was able to grab 16 rebounds. Arinze Onuaku had a monster game of 26 points and 30 boards, but his performance couldn’t keep Meralco (5-1) from losing its first game of the tournament. Tyler Wilkerson (SMB) - 27pts, 10rebs, 2asts, 1stl, 2blks, 2 triples. Arinze Onuaku (MER) - 28pts, 30rebs, 3asts, 2blks, 13/17 FGs.